The control panel enables the operator to easily operate all of the hydraulic functions of the R870R, R950R, and R990R. With the power switch on, the zone selector dial (number 4) determines which functions are active by powering either Zone 1 or Zone 2. With the zone selector switch moved to activate Zone 1 the operator can fold the rear mowers into transport position or adjust the cutterbar flotation on either the front or rear cutterbars. 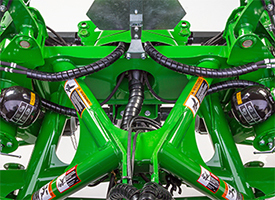 The rear mower conditioners can only be raised into the transport position after turning off the rear PTO and waiting for all components to stop moving. 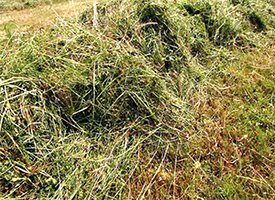 The rear mower-conditioners must also be moved into the headland position prior to folding for transport. The left-hand switch in zone 1 is used to fold and unfold the mower-conditioner. The switch must be held while activating the proper tractor selective control valve (SCV) to fold or unfold the mower-conditioner. It is a momentary switch and will return to its neutral position when released. A mechanical lock secures the platforms in the transport position. Right position - the right-hand cutting platform will remain raised when reentering the crop (used to avoid recutting windrows). 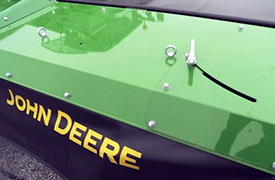 Starting in model year 2016, there will be three triple-mounted mower-conditioner (TMMC) systems available from John Deere. 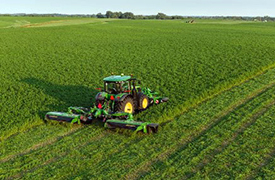 The R870R system will have a front-mounted F310R mower and two rear 3.1-m (10.2-ft) wide mower-conditioners for a total of 8.7 m (28.5 ft), system cutting width. 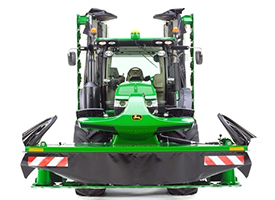 The R950R will also have an F310R on front but will have two 3.5 m (11.5 ft) mower-conditioners mounted on the rear for a total of 9.5 m (31.2 ft) cutting width. The final and largest system is the R990R. This TMMC system will have three 3.5 m (11.5 ft) mower conditioners for a cutting width of 9.9 m (32.5 ft) per pass. 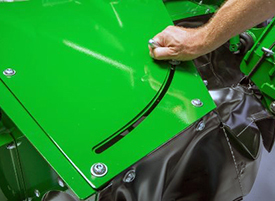 To prepare for transporting, the side curtains of the F310R or F350R Front-Mounted Mower-Conditioner are manually unlocked and folded into the transport position. This will reduce the overall width during transport. The transport lock lever on the front-mounted mower-conditioner is engaged so that side-to-side oscillation during transport is eliminated. The side shield protection and side curtains are unlocked and pinned automatically to reduce the overall transport height of the TMMC. 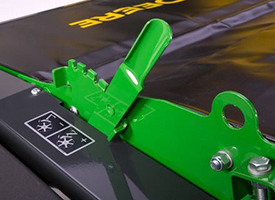 The side shield protection provides rigidity to the side curtains during cutting and is folded down in transport to reduce the overall height. When getting the rear mower conditioner in working position with the monitor, the protective side shield, fitted on both side, automatically move in working position thanks to 2 hydraulic cylinders. When preparing the rear mower conditioner in transport position, the shields will come back automatically in transport position. 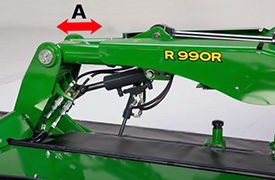 Rear three-point hitch may be adjusted, as necessary, to assure the overall height of the mower-conditioner does not exceed 4.0 m (13 ft, 1 in.). 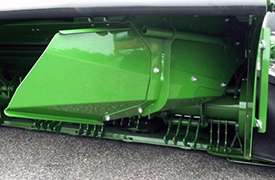 A spring-loaded safety lock on the main frame secures the mower-conditioner in the raised position. 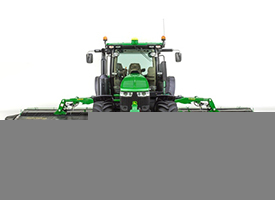 The transport width will be dictated by the transport width of the Front-Mounted Mower-Conditioner, meaning 2.99 m (9.8 ft) with the F310R, and 3.48 m (11.4 ft) with the F350R. Once the front mower is in transport position, return to the cab of the tractor. 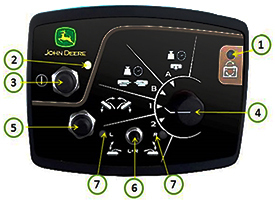 To fold the rear mowers into the transport position, place dial indicator (4) in picture below on setting 1 and depress button 5 and tractor selective control valve (SCV). 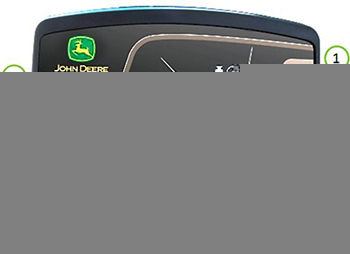 Power is transmitted from the 1000 rpm tractor with 44.4-mm (1.75-in.) 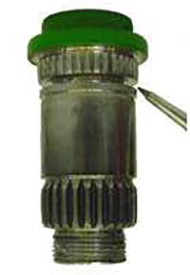 power take-off (PTO) through a central gearcase to the twin rear-mounted cutterbars. Each cutterbar is protected by a slip clutch and overrunning clutch. The cutterbar is securely mounted within the frame for strength and durability. To meet serviceability, the cutting bed is lubricated for life; no oil changes necessary. Cutting height is adjusted by changing cutting angle. Pinion gear is easily removed from the top of the cutterbar for service. Idler gears can be removed from access area after removal of pinion gear. Groove on quill shaft, designed to shear upon severe impact with a foreign object, reduce the possibility of damage to the internal components of the cutterbar. This cutterbar has been developed to increase productivity through a significant down-time reduction when changing knives. The amount of time spent on changing dropped down from three minutes per knife to about 15 seconds. It is an efficient way to save up to 40 minutes of maintenance time on each platform. 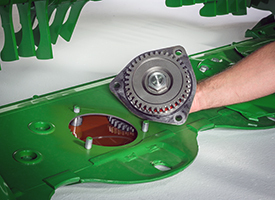 Each mower conditioner on the R870R is fitted with seven disks. The R950R and the R990R are fitted with eight disks. 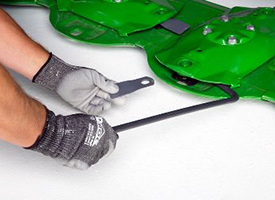 Operators only need to insert the special tool (attached to the mower-conditioner) between the disc and spring blade, push it down and remove the knife. No parts are lost during the change process. Operator comfort is even further enhanced since knives used on the QKE cutterbar are designed to provide nearly the same cutting height as the classic cutterbar from 35 mm to 85 mm (1.4 in. to 3.3 in.). These knives, with a double cutting face, are the only one to guarantee excellent cutting quality and efficient use with the QKE cutterbar: no crop accumulation and easy come back to cutting position. The cutterbars are fast mowing, with high-quality work and reliable setup. With seven discs, the cutting width will be 3.1 m (10.2 ft), and with eight discs 3.5 m (11.5 ft). Discs are fitted with quick-change knives technology. 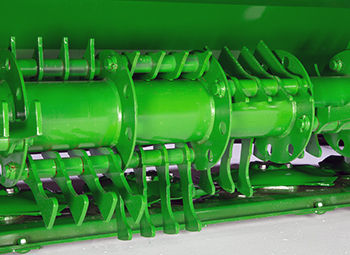 The R870R is equipped with four tines in V-shaped on both sides of the conditioner and 76 straights. 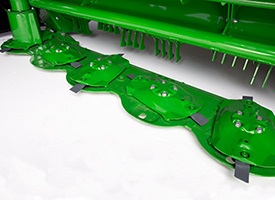 The R950R and R990R are equipped with four tines in V-shaped on both sides of the conditioner and 100 straights. Flotation is controlled by accumulators on both the right-hand and left-hand cutting platforms. The easy-to-read pressure gauges (one for each cutting platform) enable the operator to easily adjust the float pressure to the desired level. 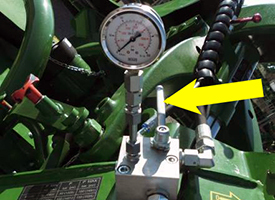 A ball valve by the pressure gauge is opened by hand and by a selection on the control box mounted in the tractor. The tractor selective control valve (SCV) pressure can be adjusted to meet various ground or crop conditions. The control box is used to adjust flotation of both the rear cutting platforms. For the R870R, usual pressure will be 90 bar, (11305 psi). Minimum will be 80 bar (1160 psi), and the maximum pressure will be 100bar (1450 psi). For the R950R and the R990R, usual pressure will be 100 bar (1450 psi). Minimum will be 90 bar (1305 psi) and the maximum pressure will be 110 bar (1595 psi). The front and rear mower-conditioners utilize a hydro-pneumatic suspension system enabling them the ability to follow ground contours. This simple system requires no springs to adjust the flotation system. Double-rod hydraulic cylinders are used to both lift the cutting platform and provide flotation. One side of the cylinders is linked to an accumulator to provide flotation. The other side of the cylinder is used for lifting the cutting platform for transport or going over headlands. Suspension system enables cutting platform to follow ground contours at productive cutting speeds. Flotation is adjusted by opening a valve and using the tractor selective control valve SCV lever to alter pressure according to field profile. An easy-to-read gauge enables the operator to confirm that the pressure is within the recommended range. Ground pressure remains consistent even when cutting on uneven ground. To improve driver comfort, hydraulic overlapping is available with +/- 20 cm (+/- 7.9 in.) if needed, actuated from the monitor in the cab. Ground contour following will be + 24 cm (+ 9.4 in.) upward and – 22.5 cm (- 8.9 in.) downward. Ground clearance when raising the platform on headlands is approximately 40 cm (16 in.). + 13.3 degrees / - 8.1 degrees with 50 cm (19.7 in.) overlap. + 8.7 degrees / -4.1 degrees with 30 cm (11.8 in.) overlap. Should an obstacle be encountered, the cutting platform swings back and lifts up to pass over the obstacle. This reduces the potential damage to the cutting and conditioning unit and decreases maintenance costs. For productivity and ease of use, the machine automatically resets on the go. This flotation system ensures a perfect ground following, reducing soil compaction and providing an excellent cut. 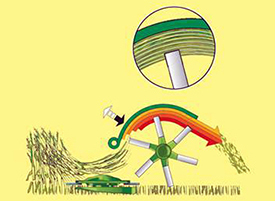 Crop stubble is preserved and regrowth is accelerated.